Sheet Music by G. M. Garrett from J. H. Hopkins, ed., Great Hymns of the Church Compiled by the Late Right Reverend John Freeman Young (New York: James Pott & Company, 1887), #55, pp. 86-7. Words: "Trench's Sacred Latin Poetry." Translation: "Slightly altered from E. Charles. Note from John Julian, Dictionary of Hymnology, Appendix, Part II, and New Supplement (1907), alt. Eia mea anima, Bethlehem eamus. J. Mauburn. [Christmas.] In his Rosetum exercitiorum spiritualium et sacrarum meditationum, N. P. 1494 [Brit. Mus. ], this is found at folio 104 b, as a Rosary on the Birth of Christ, in 13 stanzas of 10 lines. The full text is also in Wackernagel, i. No. 402, and in Dreves, xlviii., p. 515. Three stanzas, beginning with stanza iv., "Heu quid jaces stabulo," passed into many of the older German hymn-books, and are found as a separate hymn in Rambach, i., p. 371; Daniel, i., No. 481; and Trench, 1864, p. 114. 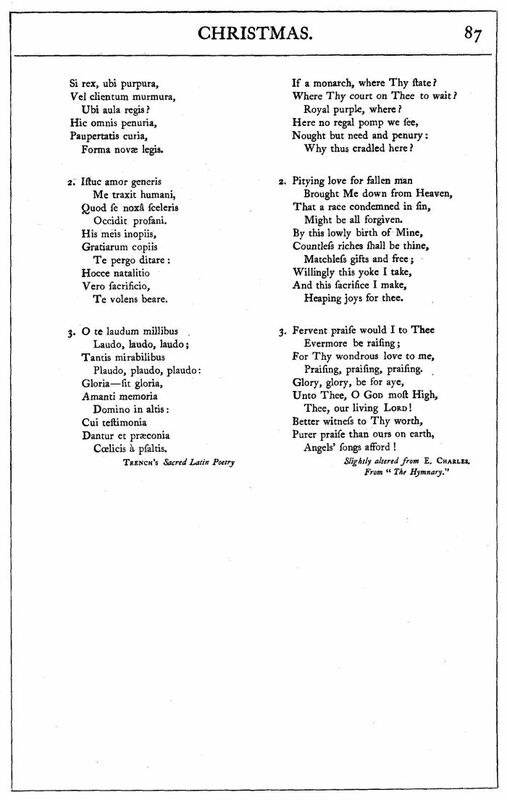 These stanzas have also been translated from the Latin into English, as "Dost Thou In A Manger Lie," by Mrs. Charles, 1868, p. 174. Also in the Hymnary, 1872. Another translation of "Heu quid jaces" is "Ah! Lord God, The World's Creator," by G. R. Woodward in his Songs of Syon, 1904. Dost Thou In A Manger Lie, by Elizabeth Rundle Charles (1868), p. 174. Ah! Lord God, The World's Creator by G. R. Woodward in his Songs of Syon, 1904. Swathed and Feebly Wailing, Translation by Rev. Dr. Kynaston, from his "Occasional Hymns" (1862). In the manger's shade ? Bend not o'er Thy rest ! Who all things didst create? To lift our fallen state? Where is all thy glory now? Now My Soul To Bethlehem, from Richard R. Terry, Two Hundred Folk Carols, a five-verse excerpt that partially includes the three verses above. Law most new and loyal. 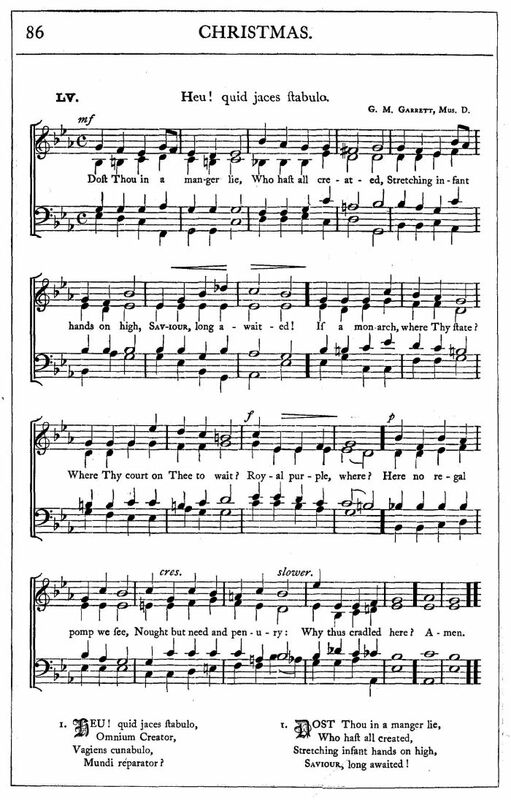 An "imitation" of this carol was written by Rev. John Mason Neale: Young And Old Must Raise The Lay-1855.